WASHINGTON (AP) — President Donald Trump will host Jordan's King Abdullah II at the White House next week. The White House said Thursday that Abdullah and Queen Rania would visit on Monday. The statement said the allies will discuss "terrorism, the threat from Iran and the crisis in Syria, and working towards a lasting peace between Israelis and Palestinians." CAIRO (AP) — Egyptian airport officials say President Donald Trump's Mideast team has arrived in Cairo on the latest stop in a regional tour to discuss a blueprint for an Israeli-Palestinian peace deal. The officials say Trump's son-in-law and senior adviser Jared Kushner, and Mideast envoy Jason Greenblatt, will meet with President Abdel-Fattah el-Sissi and other Egyptian officials Thursday. RIYADH, Saudi Arabia (AP) — Saudi Arabia says it will host a meeting among several Gulf Arab countries to offer support to Jordan after it faced mass protests over the kingdom's economic problems and its plans to tax its citizens. The Saudi Royal Court said the meeting Sunday in Mecca would include Saudi Arabia, Jordan, Kuwait and the United Arab Emirates. TIRANA, Albania (AP) — International senior officials and experts have gathered in the capital of Albania to discuss coordinated efforts in the fight against terrorism. The gathering on combating violent extremism held Monday in Tirana was the first consultation held outside Jordan as part of the Aqaba Meetings, launched by Jordan's King Abdullah II in 2015. The king, who is dealing with large protests in Jordan, was expected at the meeting but replaced by Prince Ghazi Bin Mohammad. AMMAN, Jordan (AP) — Thousands of Jordanians protested against a planned tax increase for a fourth straight day Sunday, marching toward the office of the prime minister and demanding his resignation. King Abdullah II asked Prime Minister Hani Mulki to report to the royal palace Monday, the military's website Hala Ahbar reported, raising speculation he might be sacked. AMMAN, Jordan (AP) — Several thousand Jordanians have joined the largest protest yet against the government's recent austerity measures, including price hikes and planned tax increases. Riot police scuffled with demonstrators late Saturday and fired several tear gas volleys to keep them away from the prime minister's office. Protesters chanted, "The people want to topple the government." AMMAN, Jordan (AP) — Hundreds of Jordanians have protested against government-ordered price and tax increases, scuffling with police outside the prime minister's office. Demonstrators chanted "the people want to topple the government" late Friday as helmeted police pushed them away from the building. AMMAN, Jordan (AP) — A Russian helicopter billed as the largest in the world was a central attraction at an international homeland security conference and weapons exhibition held in Jordan. More than 350 companies from 35 countries were represented at the four-day Special Operations Forces Exhibition and Conference (SOFEX) which ends Thursday. Organizers say 99 delegations from 53 countries attended. It was the 12th conference since Jordan's King Abdullah II founded it in 1996. RAMALLAH, West Bank (AP) — Visiting Japanese Prime Minister Shinzo Abe told Jordan's King Abdullah II on Tuesday that he hopes to upgrade Tokyo's ties with the kingdom into a strategic partnership. Abe told the monarch that "Jordan's stability is indispensable for regional stability," and that Japan will provide as much aid as possible to ensure the country's economic and social stability. The Japanese prime minister was accompanied by a delegation of business leaders. AMMAN, Jordan (AP) — Jordan's King Abdullah II says that "life for Jordanians today is very, very tough" as a result of a large refugee influx and that he feels the international community has "let down our people." He spoke to Russia's TASS news agency in comments published Tuesday, ahead of a trip to Russia. ISLAMABAD (AP) — Pakistan's foreign ministry says Jordan's King Abdullah II has arrived in the capital, Islamabad, to meet top government officials. Abdullah was received on his arrival at the airport on Thursday by Pakistan's President Mamnoon Hussain. A statement issued by Hussain's office says the king will also meet with Prime Minister Shahid Khaqan Abbasi. The ministry says regional and international matters of mutual interest will be discussed. AMMAN, Jordan (AP) — Jordan's king has assured the Palestinians he will defend their "legitimate rights" to independence and a capital in east Jerusalem in dealings with the international community. Abdullah II met Monday with Palestinian President Mahmoud Abbas, who is pushing back against last month's U.S. recognition of contested Jerusalem as Israel's capital. AMMAN, Jordan (AP) — Jordan's king affirmed his support Sunday for establishing a Palestinian capital in east Jerusalem, highlighting his differences with the Trump administration on a central issue in the Israeli-Palestinian conflict. Abdullah II spoke at the start of a meeting with German President Frank-Walter Steinmeier, who also expressed concern about President Donald Trump's recognition last month of contested Jerusalem as Israel's capital. NICOSIA, Cyprus (AP) — The leaders of Cyprus, Greece and Jordan pledged a new partnership Tuesday with tighter cooperation on fighting terrorism, and rallied international support for countries hosting hundreds of thousands of refugees fleeing the war in Syria. Cyprus President Nicos Anastasiades said that three-way talks with Jordan's King Abdullah II and Greek Prime Minister Alexis Tsipras aimed to jointly bolster security in the eastern Mediterranean. WASHINGTON (AP) — Vice President Mike Pence will travel to Egypt, Jordan and Israel this month after postponing a trip to the Middle East in December following President Donald Trump's decision to recognize Jerusalem as Israel's capital, the White House announced Monday. ISTANBUL (AP) — Leaders and high-ranking officials of Muslim countries will meet Wednesday in Istanbul for an extraordinary summit to discuss "repercussions" from the U.S. recognition of Jerusalem as Israel's capital. The Organization of Islamic Cooperation session aims to produce a "unified Islamic position." The umbrella organization of 57-members called U.S. President Donald Trump's statement last week an "illegal decision" and a "serious escalation." COLUMBUS — Produce grown at Erstwhile Farm has fed many people. The organic vegetables, pasture-raised pork, chicken and eggs that Lanette and Larry Stec have on their rural Columbus farm are sold year-round to hungry customers. Some of the products have been featured in stores and on menus in Omaha, Lincoln, Columbus and out of state. Recently, even royalty got a taste of the sweet corn produced by the couple. AMMAN, Jordan (AP) — Jordan's state news agency says King Abdullah II is hosting a high-level conference on fighting terrorism and extremist ideologies, particularly in West Africa. The Petra agency said Friday that the weekend gathering in the Red Sea resort of Aqaba is to be attended by presidents of several West African countries, U.S. Defense Secretary Jim Mattis, senior officials from Europe and Latin America as well as representatives of international organizations. 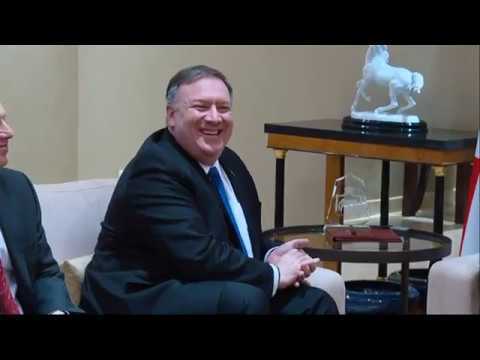 AMMAN, Jordan (AP) — Jordan's king met Monday with an influential Iraqi Shiite leader, as the United States stepped up efforts to contain the influence of Shiite-led Iran in the Middle East. Saudi Arabia, a U.S. ally and leader of the region's camp of Sunni Muslim states that also includes Jordan, is concerned about the influence of its regional rival Iran in Iraq. Iran has backed Shiite militias fighting against the Islamic State group in Iraq. AMMAN, Jordan (AP) — Jordan's King Abdullah II says he is "deeply concerned" with the situation in southern Syria and that his country's border with Syria would only reopen "when the right security conditions materialize on the ground." The monarch told the state news agency Petra in an interview published Thursday that the military campaign against the Islamic State group in Syria "could push it south toward Jordan" and that Jordan's top priority is to protect its border. AQABA, Jordan (AP) — Water-poor Jordan has launched a project using seawater to produce crops with clean energy. Jordan's King Abdullah II and Crown Prince Haakon of Norway, which contributed most of the $3.7 million cost, inaugurated the facility Thursday in the kingdom's Red Sea port city of Aqaba. Haakon told reporters he was "impressed by the way innovative ideas have been translated into a plant the size of four football fields." RAMALLAH, West Bank (AP) — Jordan's king flew by helicopter to the West Bank on Monday — a rare and brief visit seen as a signal to Israel that he is closing ranks with the Palestinians on key issues, such as a contested Jerusalem shrine. Palestinian President Mahmoud Abbas and Abdullah II met for about two hours, after a red-carpet welcome for the monarch at the Palestinian government compound in the West Bank city of Ramallah. RAMALLAH, West Bank (AP) — A Palestinian official says Jordan's King Abdullah II is visiting the West Bank on Monday for the first time in five years. The official, Mohammed Ishtayeh, said Sunday that the monarch is to meet with Palestinian President Mahmoud Abbas. The rare visit is seen as a closing of ranks on a key issue — the fate of a contested Jerusalem shrine at the center of recent Israeli-Jordanian and Israeli-Palestinian tensions. Jordan's King Abdullah II has told President Donald Trump that further coordination is important to prevent renewed tensions over a contested Jerusalem shrine. The Royal Court says the monarch also told Trump in a phone call Friday that he valued the "key role" the U.S played in defusing the latest crisis. AMMAN, Jordan (AP) — Jordan's King Abdullah II lashed out at Israel's prime minister on Thursday, saying everyone in the kingdom was "infuriated" by what he called "unacceptable and provocative behavior" in connection with a deadly shooting at Israel's Embassy in Amman earlier this week. The monarch's unusually harsh language appeared aimed, in part, at defusing widespread anger in Jordan over the shooting in which an Israeli Embassy guard killed two Jordanians, including a 16-year-old.